The start of baseball season is still several days away, but a recent survey conducted by Bank of America Merrill Lynch found that 59 percent of U.S. fund managers believe the current stretch of economic growth is in its “final innings.” This is the highest reading since the financial crisis in 2008. As if to support this outlook, the Commerce Department released economic data last Friday that shows fourth-quarter 2015 corporate profits fell at their fastest rate since—you guessed it—the same period in 2008. Even though year-over-year GDP growth in the fourth quarter was revised to 1.4 percent, up from 1 percent, profits tanked a substantial 11.5 percent. For the entire year, pretax earnings declined 3.1 percent. 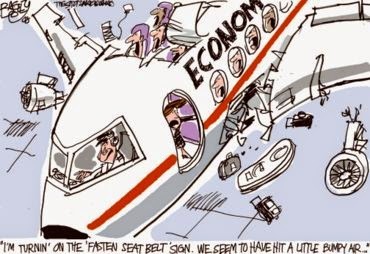 This could end up being a speedbump for the U.S. economy. In the past, significant drops in corporate profits have acted like gravitational tugs on jobs growth, with companies cutting positions and putting a freeze on new hiring. 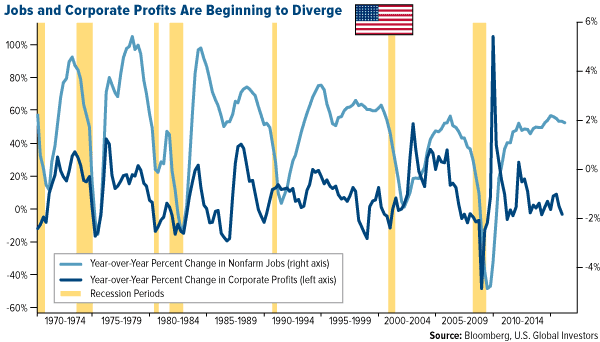 We have yet to see this play out—jobs growth has been steady for 72 straight months, jobless claims have been falling and confidence in the labor market is at a nine-year high—but the divergence between profits and employment is something to keep an eye on. 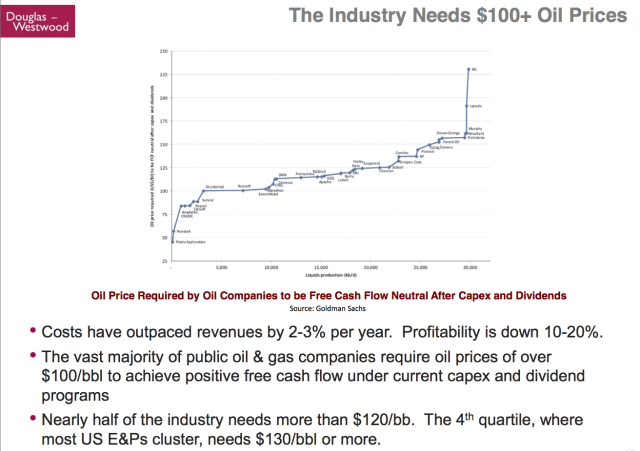 This is no reason for investors to panic, however. When I look at the chart above, I see fairly regular cycles of economic activity, like the EKG readings of a reasonably healthy person. It’s possible we’re facing the final stage of this particular economic cycle, as a majority of fund managers suspect, but mean reversion could eventually bring conditions back to “normal.” Speaking to the Economic Club of New York on Tuesday, Federal Reserve Chair Janet Yellen called the U.S. economy “remarkably resilient,” and I agree with her. 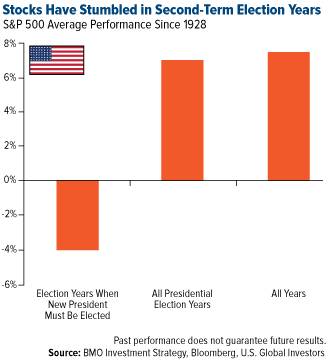 It’s also important to remember that this is the eighth year of a two-term presidency.Historically, stocks have performed above average during election years, but second-termelection years have been the weakest going back to 1928, falling an average 4 percent. As I explained earlier this month, this might stem from the uncertainty of who will succeed the incumbent president, and what his or her policies will be. 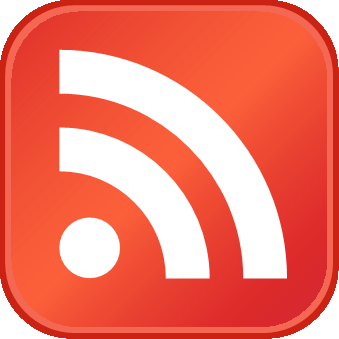 During her speech, Yellen stated that the Fed will proceed with a “cautious approach,” and investors should do the same. Gold has been used during times of inflation, currency weakness and other economic disruptions. This includes negative real interest rates, which drop the yield on a government bond below zero. The yellow metal rallied more than 1 percent following Yellen’s statements on Tuesday, after contracting last week. I’ve also discussed in detail how municipal bonds have done well even when equity markets turn especially volatile, and now might be a good time to consider them with recessionary fears rising. Muni bond funds have seen 24 consecutive weeks of net inflows, according to financial services firm Baird, with $901.5 million moving into them in the week ended March 23. Plus, the Fed has indicated it still plans to raise interest rates at least twice this year. Bond prices fall when rates rise, but short-term munis are less sensitive to rate fluctuations than longer-term bonds.